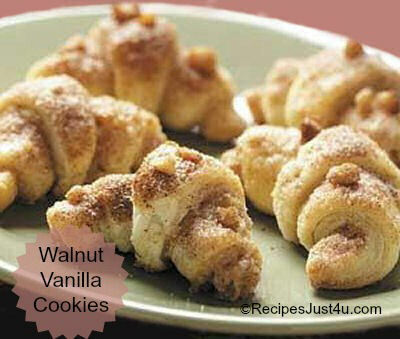 Roll your dough like a crescent roll and add vanilla walnuts, cinnamon and sugar for a tasty sweet treat that is sure to delight your family. The dough needs to sit for at least four hours but you can make it the day before and finish the cookies the next day. These rolled dough cookies are sweetened with cinnamon and sugar and have the crunch from walnuts. In a food processor, combine the flour and salt; add in the butter and pulse until the mixture resembles coarse crumbs. In a small bowl, whisk the egg yolk, sour cream and vanilla extract; add this to crumb mixture and mix well. Cover and refrigerate for at least 4 hours. Divide the dough into thirds. On a lightly floured surface, roll each portion into a 10-in. circle. Combine the walnuts, sugar and cinnamon; sprinkle ¼ cup of the mixture over each circle. Cut each circle into 12 wedges. Roll up each wedge from the wide end and place point side down 1 in. apart on greased baking sheets. Curve ends to form the shapes into crescents. Whisk the egg white until foamy; brush over crescents. Sprinkle with the remaining nut mixture. Bake at 350° for 18-20 minutes or until lightly browned. Remove to wire racks and cool. Store in an airtight container.